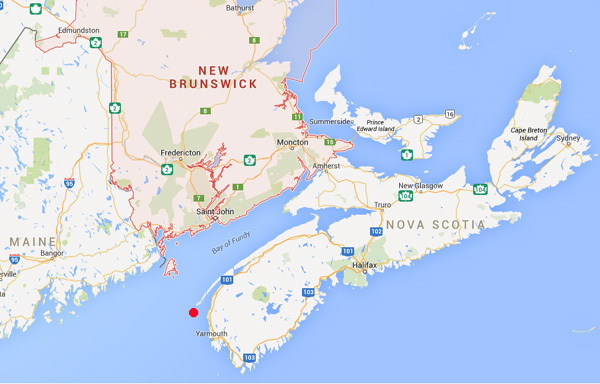 "Brier Island has been the Fundy Graveyard for scores of ships over the generations . 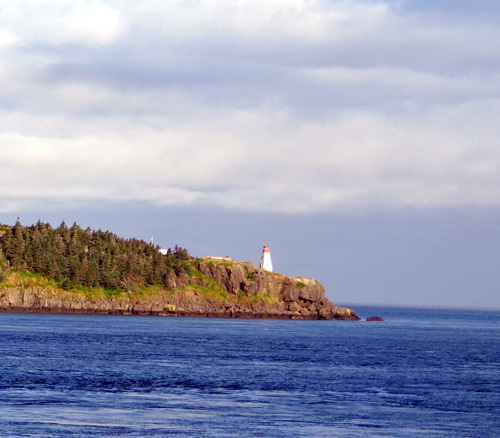 . .
the three beacons have guided mariners along Brier Island's shores." 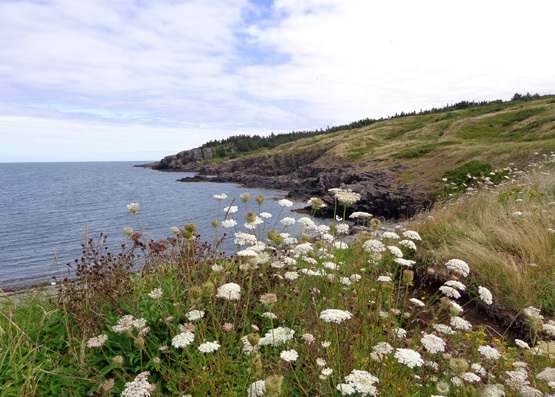 Brier Island is indeed in a precarious position at the entrance/exit to the Bay of Fundy, through which an enormous amount of water flows in and out every twelve hours. 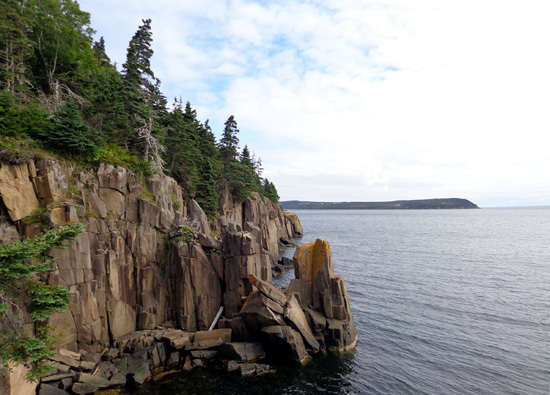 As mentioned previously, the tides in this large bay are some of, if not the, highest in the world, topping out at about 52 feet at the northern end of the bay in the Hopewell Rocks and Minas Basin areas. At the lower end of the bay the tidal variance is "only" about 22 feet, still a significant amount. 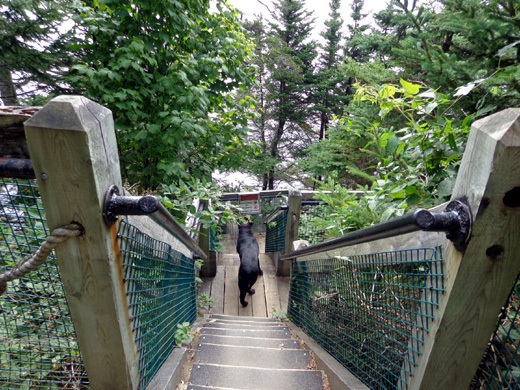 Today we took the dogs with us to explore Long and Brier Islands, which are located at the southern end of Digby Neck. 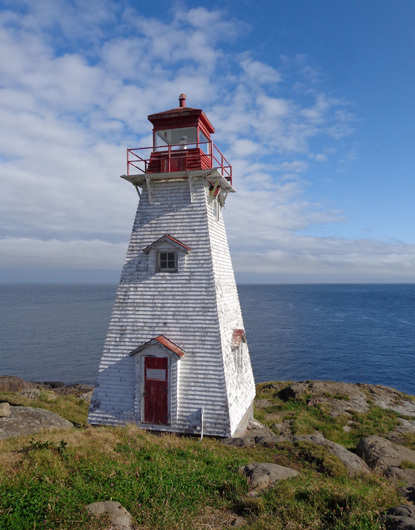 We had a fun day and saw two of the critical lighthouses on Brier Island and one on Long Island. Visiting these islands by vehicle involves taking a short ferry ride to each island. 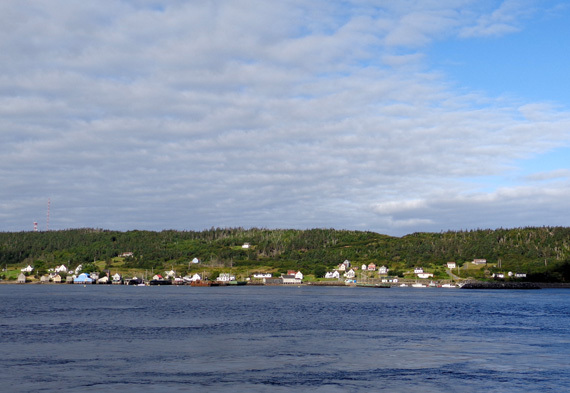 The ferries are run by the Province of Nova Scotia. We got to ride four times on today's out and back day trip (ditto for the next day's trip to Westport for the whale cruise). The first ferry goes from the tiny town of East Ferry at the end of Digby Neck to the town of Tiverton on Long Island. It leaves on the half hour each hour (i.e., 8:30, 9:30, 10:30). 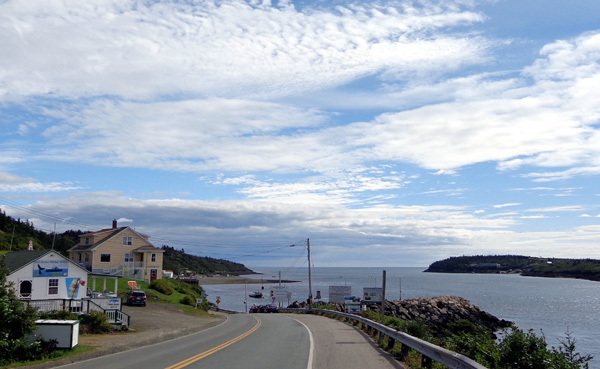 It's a short ride across Petit Passage, taking only about three minutes once the ferry starts moving. If there are too many vehicles for a crossing, the ferry will come back and take the remainder that were there on time. It holds about 21 vehicles three abreast, or fewer if there are any RVs or commercial trucks on board. the northern end of Long Island is visible on the right. Long Island is about 11 miles long and 2�-3 miles wide; NS 217, a nice paved road, goes right through the middle of it. 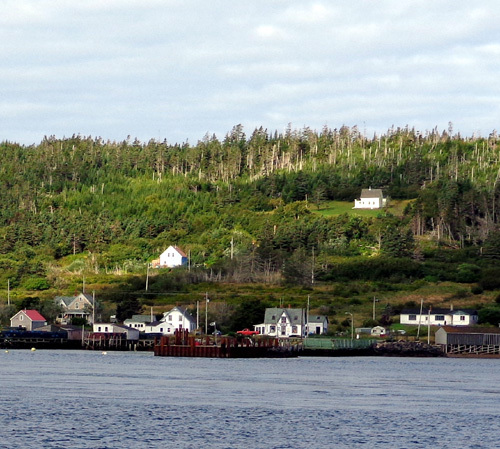 If someone is on their way to Brier Island, they can drive those 11 miles fast enough to get to the next ferry that goes between Long and Brier Islands every hour on the hour. That ferry is smaller and can't carry larger RVs because they'd bottom out at the bottom of the ramp in either direction, especially when the tide is lower (the ramp rises and falls with the tide). 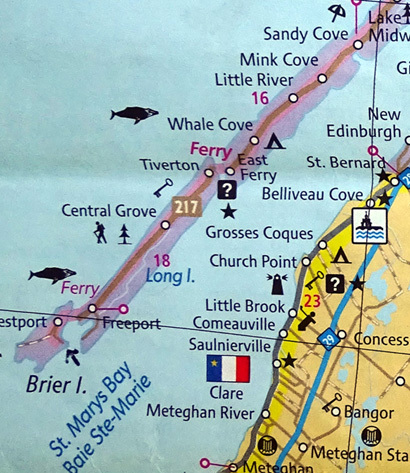 Although Grand Passage is wider than Petit Passage, the ferry ride there takes only about five minutes between the towns of Freeport on Long Island and Westport on Brier Island. 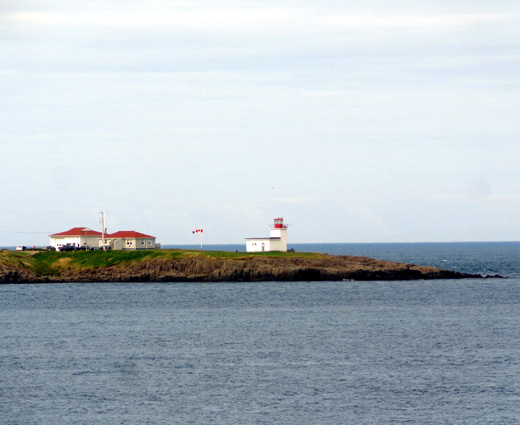 Brier Island is the end of the line. There are some more little islands at the SW end of Brier Island but they aren't inhabited by humans. for our ferry across Petit Passage this morning. Each outbound ferry ride costs $5.50 for passenger vehicles and $6.50 for commercial vehicles. I don't know what RVs cost. 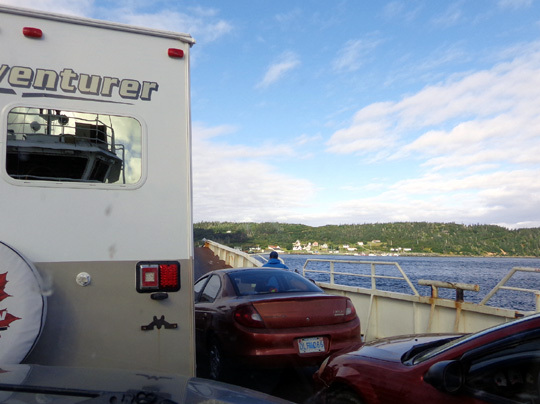 The Class A that was parked next to us last night at Whale Cove was on our ferry ride to Long Island this morning and so were three smaller Class C motorhomes from our campground. There is no charge on the return ferries. We got a good tip from our campground hosts to purchase a "punch card" for $13.50. It's more cost-effective for folks who plan to go out on three or more ferry rides. It's $13.50 for ten punches, or ten outbound ferries. We got one of those because we planned to take two out-bound trips to Long Island and two to Brier Island = four punches. The ferry guys don't tell you that so we were glad for the information (it's on the ferry system website, though). Residents can purchase annual passes, which are less expensive. We had six punches remaining on our card at the end of our stay. 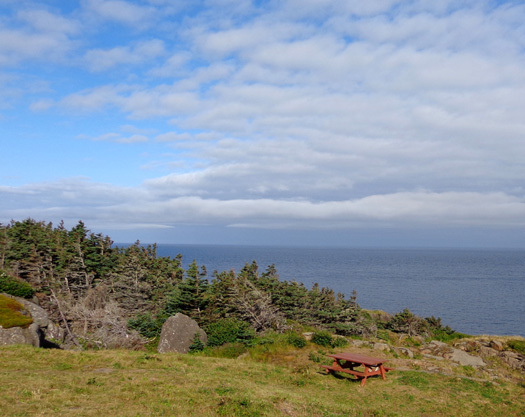 When we left Whale Cove we gave our partially-used pass to the campground owners to give to another visitor -- "paying forward," I guess you'd say. but I'd already gotten pictures across Petit Passage from shore so it didn't matter. Casey loved the two guys operating the second, smaller ferry between the two islands; they gave her lots of attention in both directions. We got a list at our campground of about 20 things to do and see on the islands. We did about half of them today. Good thing we went there when no one else did because the narrow gravel road would be difficult to meet oncoming traffic and the parking area at the overlook was very small. 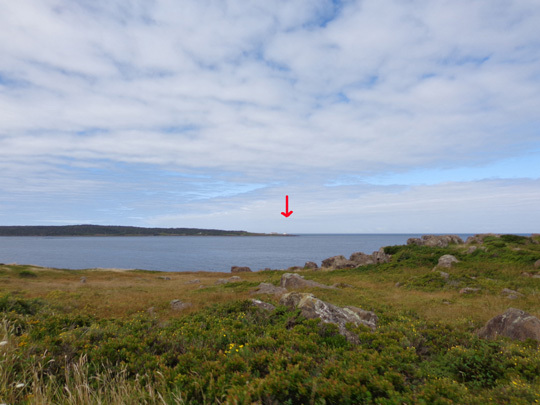 Although the lighthouse is located in what appears to be a critical location at the northern entrance to Petit Passage, it is no longer in service. 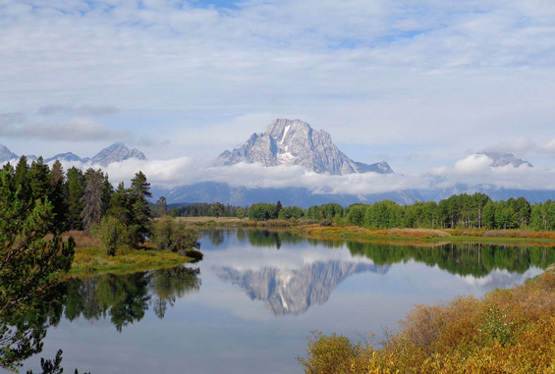 It is maintained by a non-profit organization for visitors to enjoy. Jim looks out to the northern entrance to Petit Passage. 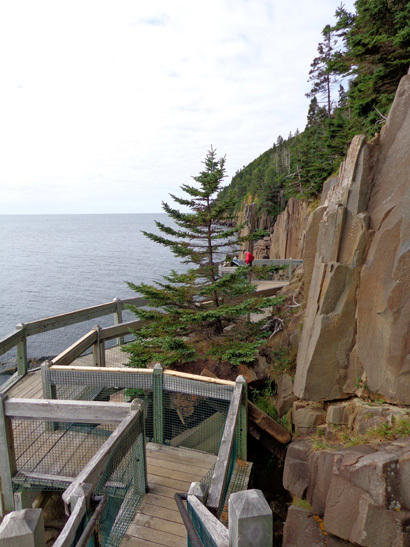 Nice place to eat lunch -- overlooking the Bay of Fundy -- but it was too early for us. Our next stop was at Long Island's small visitor center for a good map of the islands and a tide chart. High tide was about 10:35 AM, about half an hour after I picked up the chart. 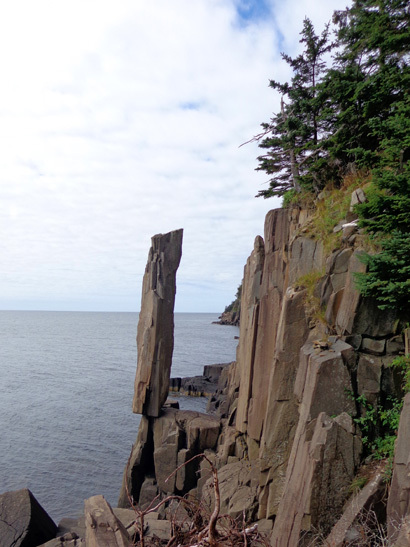 Then we went to Balancing Rock, a tall columnar formation on the St. Mary's Bay side of the island. Promotional literature describes it as "a spectacular basalt sea stack that rests precariously on its end:"
I haven't read its exact height but I'd guess it's about 12 feet tall. 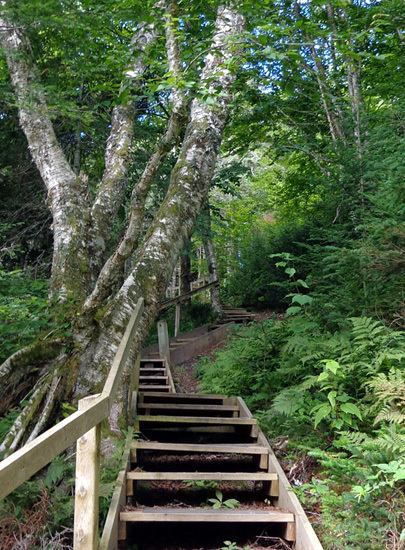 Visitors reach the formation at the end of a 1.25-mile trail that goes through a bog, woodlands, and down a steep embankment. 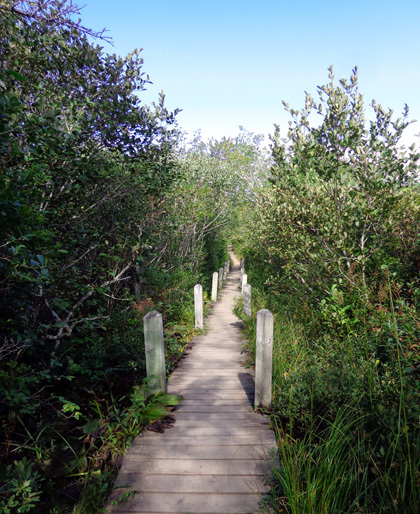 The first mile of the trail goes through wet areas on boardwalks . . . There are some interpretive signs along the way. Steeper the rest of the way down, so they added the fencing for safety. Jim and the dogs beat me down the steps because I kept pausing to take pictures. 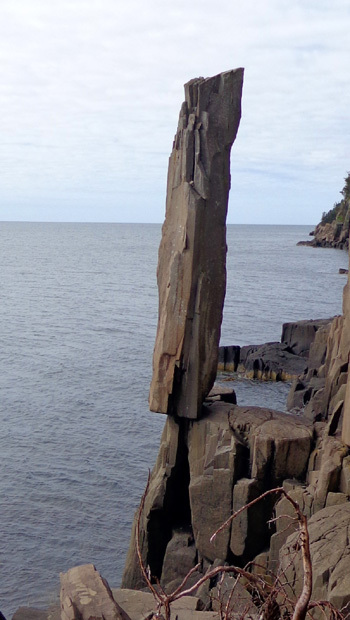 Our timing was good at Balancing Rock, too. Although we met a few folks on the path to and from the shoreline, no one was at the featured rock when we got there. It was also good timing re: the tide because it was high when we got down to the rocks on St. Mary's Bay. 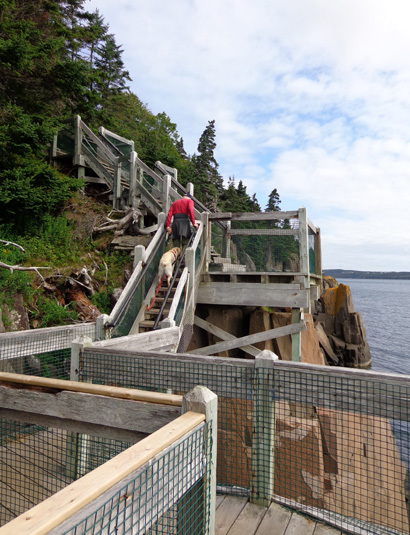 It would be interesting to see the rocks when the tide is low (tides are about 22 feet high here and at the Bay of Fundy on the other side of the island ) but neither one of us wanted to go up and down all those stairs again; going down is tough on our aging knees. 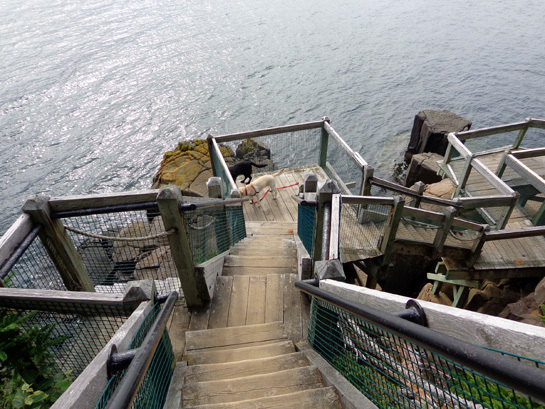 The steps are a huge improvement over the ropes that were used as recently as ten years ago, per one of the couples we talked with on our way out. The lower stair section is very steep -- can't imagine negotiating it with just ropes! The dogs also got to run around for a few minutes at Beautiful Cove, near Freeport at the SW end of Long Island. How could we not go see an easily-accessed cove named "beautiful"?? You can drive right to it. 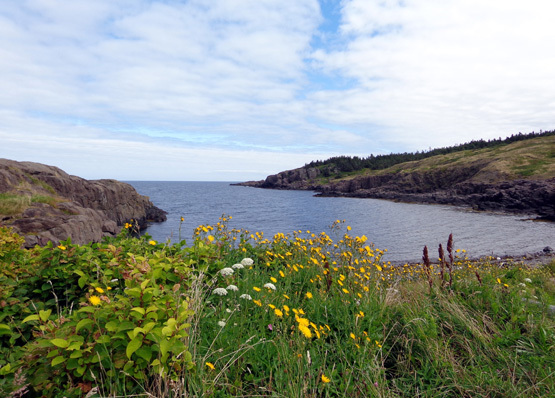 This pretty cove is popular with rock hounds for its quartz, agate, and crystal rocks on its shoreline. I did pick up some pretty rocks for my collection but I don't think they were those varieties. The tide was still pretty high and I had a limited selection of colorful rocks. The ones I chose were under water, where they were more colorful. Casey got to play with a local dog whose owner drove up while we were at Beautiful Cove. 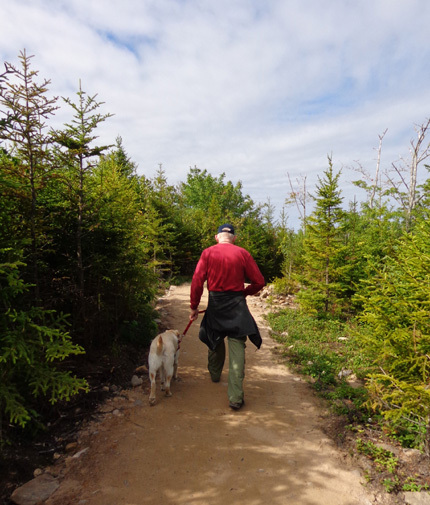 The dog was running along the dirt road to the cove and the owner was driving his truck slowly alongside. 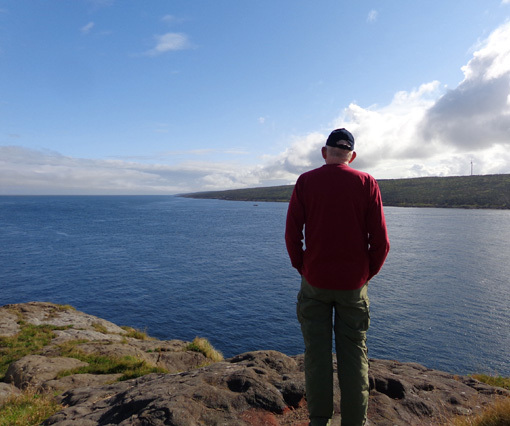 Continued on the next page: exploring Brier Island -- lots to see and do there, too!